As the Republican primary race drags on, candidates have repeatedly made an issue out of President Obama's faith — or lack thereof, according to some campaign-trail rhetoric. "I think there is in this country a war on religion," Mitt Romney told Milwaukee supporters on Monday in response to a question about the president's mandating that health insurance provided by employers cover contraceptives. "I think there is a desire to establish a religion in America known as secularism." In a Fox News interview last month, Newt Gingrich went the old-fashioned route, stopping short of saying that the president is Muslim — but arguing that he gives people legitimate reasons to believe that he's Muslim. "Why is it that he's more sensitive to radical Islamists who are killing young Americans than he is to the Catholic Church, to Baptists, to fundamentalists?" he asked. "I mean, the fact is, this is a very strange presidency." Meanwhile, on Wednesday morning, President Obama spoke at length about his Christian faith at an annual Easter prayer breakfast at the White House. 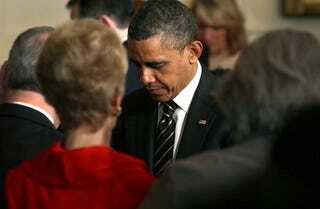 The event, which the president first held in 2010, gathered about 150 Christian leaders from across the country. "Every time I travel around the country, somebody is saying, 'We're praying for you,' " the president said, to knowing laughter from the guests. "Michelle gets the same stuff. And that means a lot to us. It especially means a lot to us when we hear from folks who we know probably didn't vote for me — and yet are expressing extraordinary sincerity about their prayers." After thanking the crowd for the work of their ministries, he claimed that he wasn't going to "stand up here and give a sermon," but went on to talk about the role of faith in overcoming doubts. He described how Jesus confronted fear before the Crucifixion by praying in the garden of Gethsemane. "It is only because Jesus conquered his own anguish, conquered his fear, that we're able to celebrate the Resurrection," the president said. "The struggle to fathom that unfathomable sacrifice makes Easter all the more meaningful to all of us. It helps us to provide an eternal perspective to whatever temporal challenges we face. It puts in perspective our small problems relative to the big problems he was dealing with. And it gives us courage and it gives us hope." The president elicited a few "amens" and "all rights" from the crowd as he began quoting from Scripture ("Jesus told us as much in the book of John, when he said, 'In this world you will have trouble … But take heart! I have overcome the world.' "). Among the breakfast's attendees were the Rev. Al Sharpton; the Rev. Julius Scruggs, president of the National Baptist Convention; Archbishop Demetrios of the Greek Orthodox Archdiocese of America; the Rev. Cynthia Hale, senior pastor at Decatur, Ga.'s Ray of Hope Christian Church (who also delivered an opening prayer); and the Rev. Leith Anderson, president of the National Association of Evangelicals.